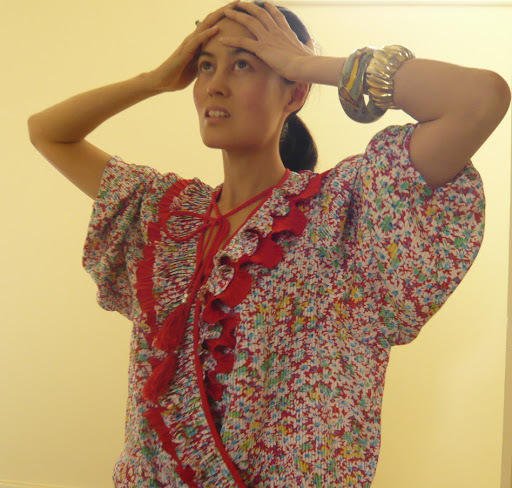 So today’s pose is somewhat of a display of multi-tasking… it hides my horrible hair while it also shows off this cute blouse by old-lady brand Dolina that I found for $7 at the op shop last week while I was waiting for my car tyres to be changed. Seeing as that operation took two hours I had time to kill and was forced*** to go through the op shop (THOUGHTFULLY LOCATED IN THE SAME SHOPPING CENTRE) for most of that time… and conveniently they had a huge $1 sale, so I also scored two dresses and some army pants. 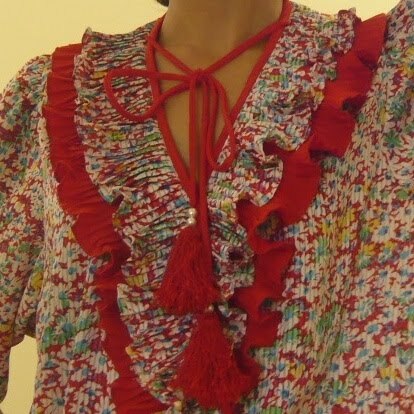 But this blouse was the most photogenic… it has red ruffles! And long cords at the neck that you can tie or leave dangling! And TASSELS!!! *swoon* My bracelets are also from op shops and were 50c each I think. *I ran 15k recently for the first time in ages and my calf muscle decided that was just being too enthusiastic, so it went on strike. It’s becoming good friends with Miss Physio. **I have to work off stress somehow! Would be so much easier to take up drinking or smoking, but exercise is cheaper. The tightarse gene is also from the Asian side of the family. ***I made a beeline there as soon as I’d handed over my keys to Mr Beaurepaires.